Let’s be honest, do you believe that? Do you believe you are flawless? For 90% of my life, I would have thought you were crazy if you had told me that, so I won’t be surprised if you feel the same way. I mentioned earlier that I was born with cancer. It was called retinal blastoma. Basically, tumors were growing on the retina of my right eye. At the time, the safest thing to do was remove the whole eye, so I have essentially lived my whole life with a prosthetic. Thus, talking about true beauty being authentic would be the end of my hope if true beauty was external. Fake eye equals fake beauty (or lack thereof), by those standards. Even the best prosthetic is still fake, and you can tell something’s not right. I know this. I live with it every day. "The truth that true beauty is authentic would be the end of my hope... if true beauty was external." But because of Jesus, I have hope. Several years ago, I was reading through Song of Songs (or Song of Solomon depending on your Bible). And I stumbled across a verse that stopped me in my tracks. Just a little background for you, Song of Songs is a love story between Solomon and his bride. But on a deeper level, it represents Christ’s love for us, because we are the bride of Christ (2 Corinthians 11:2-3; Ephesians 5:25; Revelation 22:17). 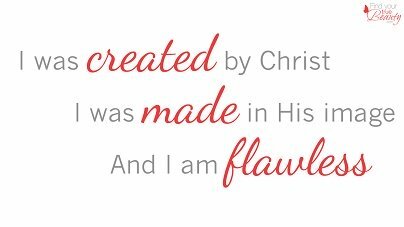 Here’s what the verse said, “You are altogether beautiful, my darling; there is no flaw in you” (4:7*). No flaw. I felt flawed. I looked flawed. But I knew the Bible was true to the very last word. So I had some soul searching to do. 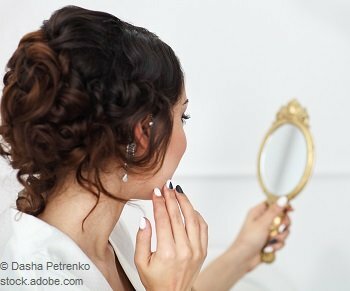 Would I believe what God's Word said about me, or would I believe my bathroom mirror? 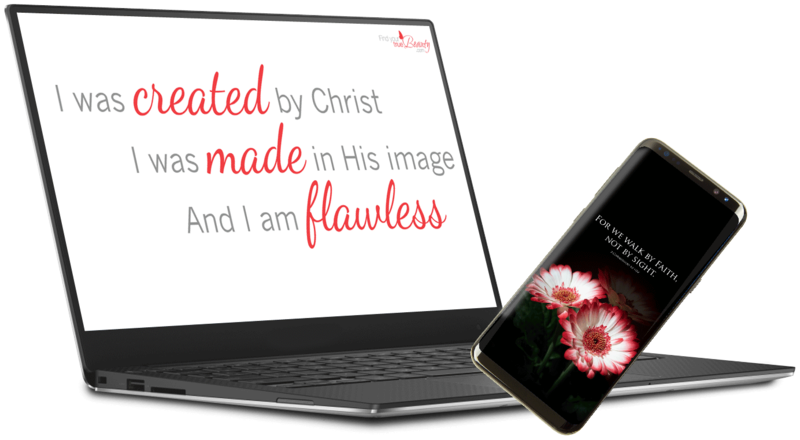 There are a few Bible verses that are always go-to verses when we talk about true Beauty that we haven’t mentioned yet. The heart is where our true beauty comes from. It’s what God is looking at. I always stopped at the verse in Samuel and got stuck on the fact that people do look on outward appearances. I would think that God may have crafted us and designed us to be flawless in His eyes, but no one else would see it. But that’s not really true either. Have you ever met someone that was drop dead gorgeous on the outside, but had an ugly personality? Maybe she was mean or rude, or self-centered. Whatever it was, she might be pretty on the outside, but that was the only thing people liked about her? She wasn’t truly beautiful, she was just easy on the eyes. Her heart, where true beauty comes from, wasn’t beautiful at all. Now, think of one of the nicest, kindest women you know. Chances are, she has an internal beauty that radiates out like Shelley mentioned earlier. She may not be a knockout by the worlds standards (or maybe she is) but what really endears her to others is the quiet beauty of her heart. I was looking at some of the women at my church a few weeks back and I realized that the ones that I admire the most, the ones I think are beautiful, aren’t perfect. They struggle with acne (or scars it left behind). Not a single one is smaller than a size 6 (in fact, most of them would be considered overweight). They all have their own quirks, but they are all beautiful. Not because of what’s on the outside, but because of their hearts. In fact, for years I have looked right past their outer appearances without a second thought. I just knew they were beautiful. If I can look past the outer appearance of others to see the true beauty of their hearts, why do I think others aren’t doing the same thing when they look at me? The media may tell us that we have to portrait a certain image to be beautiful, but through Christ I have found that there is more to being beautiful than what meets the eyes. True beauty isn't just skin deep, and you don't have to be a size three with a flawless face to be beautiful. True beauty blossoms from the depths of our hearts. The media may tell us that we have to portrait a certain image to be beautiful, but through Christ I have found that there is more to being beautiful than what meets the eyes. 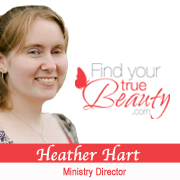 "...through Christ I have found that there is more to being beautiful than what meets the eyes." True beauty isn't just skin deep, and you don't have to be a size three with a flawless face to be beautiful. True beauty blossoms from the depths of our hearts. 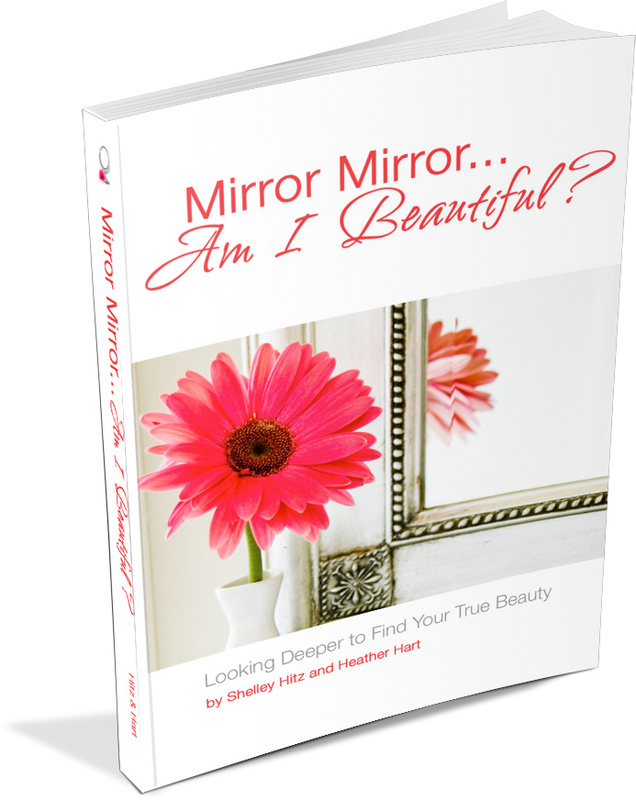 Have you been settling for this world’s beauty instead of discovering your true beauty? If so, we encourage you to discover the truth about beauty. Ask God to help you change your thoughts and desires about beauty, and He will. It may not be instant, but He will slowly begin to change you from the inside out! Jesus, books. flowers, flipflops, chocolate, and coca cola - those are a few of Heather's favorite things. She doesn't have it all together, but she's okay with that because she knows Christ has her covered when she fails. Her hope that is while she is struggling through this thing called life, she is pointing others towards Jesus along the way.